Numismatics allows each of us to study history, appreciate art and ponder the decisions of citizenry, politicians and government. Of course, the inner workings of coinage design and selection are not always made public, and this fact can lead to speculation or even fabrication. A numismatic event that I believe is fabricated is associated with a series that I have had a longstanding interest in and this is with Washington quarters. Similar to most numismatists, I have several collecting niches that overlap a certain amount and that, as a conglomerate, make my collection a whole. Two of my interests merge in the Washington quarter series and these are the series itself, one of only two series that I have ever actively sought to collect by date, and superbly toned coinage. Fortunately for me, I have over the years been able to obtain some astonishingly toned Washington quarters, as shared previously. The impetus for this post is neither superbly toned coinage nor the issued Washington quarter series. 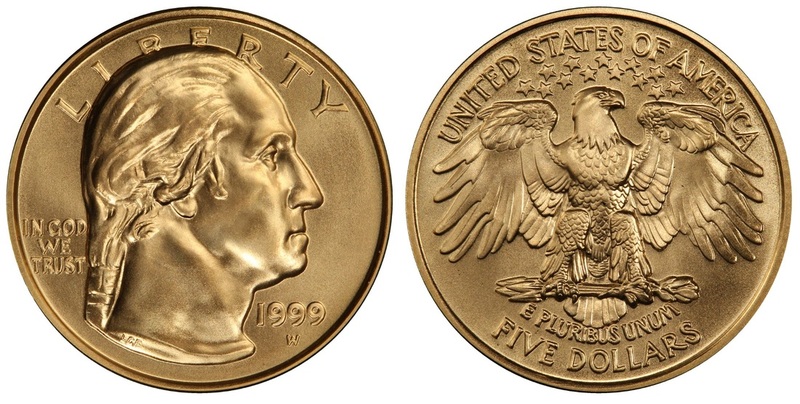 Rather, the impetus for this post is a famously rejected design for the Washington quarter series that was later used as a modern commemorative in one of the US Mint's more prescient moments. In 1931, in the midst of the Depression, the country was swept up in Washington mania and all things dealing with Washington were greatly admired. The idea of a half dollar commemorative to honor Washington arose but President Hoover indicated he would veto such a bill. He would, however, support the creation of a commemorative Washington quarter, which many had hoped might replace the then very unpopular Standing Liberty design. As it was, this came to pass. A contest was opened to the public to allow designs for the new Washington commemorative quarter to be submitted to the Commission of Fine Arts (CFA). The CFA did not have final acceptance or rejection powers over any design submitted, however, the CFA with sculptor Adolph Weinman on its panel had an advisory role to the Secretary of the Treasury. Records indicate that the open competition was disappointing with most submissions having little artistic merit. An October 27, 1931 memorandum from the Secretary of the CFA to Andrew Mellon states that of the over 100 designs submitted that the CFA and Weinman believed only seven designs had merit. This note requested that the Secretary of the Treasury review the seven chosen models so as to make his choice among them. Between this date and November 4, 1931 the CFA chose the models submitted by Laura Gardin Fraser while Secretary Mellon chose the models submitted by John Flanagan. 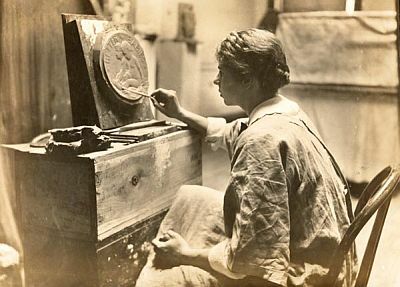 The CFA had requested to allow Fraser to rework some elements of her design to fit coinage purposes and Mellon directed that her work, along with that of Flanagan and two others, be allowed to be reworked so that all four model pairs could be inspected after a CFA critique. A letter of November 10, 1931 from the CFA to Secretary Mellon shows the interest that the Secretary had in this coinage issue and also his artistic considerations as the letter states that the CFA agrees with the Secretary as to changes that should be incorporated in the designs submitted. However, after the reworking of the models, the CFA and Secretary Mellon were still at odds over the best design. This may be attributed, in part, to the process by which the final design was chosen; Secretary Mellon was apparently inspecting large drawings or plaster casts of proposed designs while the CFA was looking more closely at coinage-sized models. In this way the two parties were not inspecting the same models, they were looking at models that were biased by the scale they were viewed in. CFA Secretary Moore tried to persuade Secretary Mellon that the scale of the models would change his position and in a letter dated January 20, 1932 Secretary Moore laid out the CFA opinions on the coinage-sized models. They argued that the Flanagan design became “artistically unfortunate” with an “unnatural arrangement” of the hair that was visible in the reduced format. They also characterized the reverse as “pictorial rather than medallic in character”. This did not sway Secretary Mellon and, although he left office on February 12, 1932 he never changed his mind. At some time in numismatic history, this decision process was labeled misogyny. The earliest reference I have ever been able to find with this twist is from Walter Breen where he wrote “It has been learned that Mellon knew all along who had submitted the winning models, and his male chauvinism partly or wholly motivated and unwillingness to let a woman win (the competition)”. The source of the opinion that Mellon was a misogynist casts a large shadow over the credibility of the statement. It has long been numismatic opinion that Breen tended to fabricate tales and data to fill in gaps in his knowledge and his epic tome serves as evidence of this where his footnotes are complete regarding many facts surrounding the Flanagan design but they are completely missing when it comes to the misogyny assertion. This, coupled with Breen’s well-documented, tortured life choices and ideas regarding sexuality and the roles of men and women makes it hard to consider this a credible source in this instance. Unfortunately, the numismatic press has at times taken what Breen wrote as researched truth and has repeated Breen’s words often enough that a new generation of numismatists believe this to be fact. Taxay, D., The US Mint and Coinage, 1966, Sanford J Durst Publishers, New York, NY, p 364. Oil painting shown on the United States Department of the Treasury web site. Taxay, D., The US Mint and Coinage, 1966, Sanford J Durst Publishers, New York, NY, pp 360-366. Contents and quotes taken from all letters between the CFA and Secretaries of the Treasury Mellon and Mills including references therein. Breen, W., Walter Breen’s Complete Encyclopedia of US and Colonial Coins, 1988, Doubleday, New York, NY, pp 364-365. Image of Laura Gardin Fraser at work from the archives of the National Cowboy Hall of Fame. Vermeule, C., Numismatic Art in America; Aesthetics of the United States Coinage, 1971, The Belknap Press of Harvard University Press, Cambridge, MA, p 180. Including references therein.